We’d love your help. Let us know what’s wrong with this preview of The American Way of Poverty by Sasha Abramsky. Fifty years after Michael Harrington published his groundbreaking book The Other America, in which he chronicled the lives of people excluded from the Age of Affluence, poverty in America is back with a vengeance. It is made up of both the long-term chronically poor and new working poor—the tens of millions of victims of a broken economy and an ever more dysfunctional political system. In many ways, for the majority of Americans, financial insecurity has become the new norm. To ask other readers questions about The American Way of Poverty, please sign up. Would it be too depressing to read this book with 4 years of highsight knowledge since its publication and the current political climate? I don't think liked is the right word, but this is a compelling and heartbreaking and I want to force everyone to read this book, especially anyone who believes that taxes are too high and people using government assistance are lazy. If you don't have time to read the whole book, at least peruse something like this review in the New York Times. But some other points for this review. Abramsky clearly lays out the way these issues are connected and come at the behest and benefit of those in power. "Too often in recent decades, our political leaders have ignored what’s staring them in the face and instead enacted policies that make economic hardship worse for those already on the margins or starting the long slide into destitution. As detailed in this book, they do so because American’s political process is increasingly beholden to powerful financial interests, its priorities shaped by what used to be seen as Southern mores: a belief not just in the inevitability of inequality, but in the desirability of oligarchy as a social structure, in the usefulness of poverty as a social control mechanism, its reaction to that poverty punitive and unforgiving." It takes a great catastrophe to bring about great action. In 1929 when the stock market crashed, people lost everything. The Roosevelt Administration responded with programs intended to provide a social safety net. The intent was to get people back to work and protect the most vulnerable; these protections have helped individuals after the Great Depression ended. However, during the Great Recession, there was no such result. In fact, more social programs were cut and have remained cut, further It takes a great catastrophe to bring about great action. In 1929 when the stock market crashed, people lost everything. The Roosevelt Administration responded with programs intended to provide a social safety net. The intent was to get people back to work and protect the most vulnerable; these protections have helped individuals after the Great Depression ended. However, during the Great Recession, there was no such result. In fact, more social programs were cut and have remained cut, further ensuring a future catastrophe. People have become too desensitized to poverty and they would rather blame the person for being poor than blame the system for creating it. What Sasha Abramsky points out in his book is that we’ve created a system that is ensuring more and more people will fall into poverty and those that don’t will blame the victims for it. The first half of Abramsky’s book focuses on the disadvantaged. It is story after story of individuals who have fallen on hard times. He covers a wide range of people and identifies the social and government situation that created it. Personal stories of poverty from those who are usually invisible, empty food pantries, people living in shacks, and those struggling to make it as all of the social services that are intended to protect them are completely overwhelmed. He also points out the hypocrisy of anti-tax conservatives in many instances. Much of this stems to the Reagan years of “Welfare Queens” driving Cadillac (which was a known lie even back then, and yet, it continues to make it easier to blame the victim). There are those who would gut the key pieces out of a program and then turn around and complain how they do not work. It seems to be a consistent strategy with some and the consequences are devastating. Through this, he also points out how the issues with solving poverty are more of a political issue than it is a force of will. Abramsky sets out to identify those problems in the first half of the book and provide solutions in the second half. Many of the solutions are easily implementable on paper, from small tax increases, to payback systems to ensure people are above the poverty line. However, the main issue goes back to political will. Abramsky is an expert in telling these stories and he is putting the weight of his solutions behind them. He would know how to connect with liberals on this side, but I felt he had a missed opportunity in talking about the community-wide impact. Poverty affects everyone. It’s not just those who have to decide between whether they heat their houses or go hungry, it’s those communities that are impacted. Businesses will not set-up shop in a community with high poverty rates, unskilled workers, and low educational attainment. The anchor stores can drive a community and create residual supporting businesses that bring jobs. That’s an impact everyone can understand and closes the loop on his original points. If people are too selfish and prefer to blame the victim, it’s best to play on that and demonstrate how everyone is affected by poverty. It’s a systemic problem and impacts everyone. A comprehensive analysis of the causes and history of modern American poverty. Though most of it is a depressing read, it ends on a remarkably optimistic note, insisting that the problem of poverty is not only tractable, but possible to solve finally in the near term. But don't expect an unbiased analysis, or a politically agreeable solution. "We will get further in understanding [...] poverty if we consider how entrenched the new plutocracy [...] has become than if we look solely for explanation A comprehensive analysis of the causes and history of modern American poverty. Though most of it is a depressing read, it ends on a remarkably optimistic note, insisting that the problem of poverty is not only tractable, but possible to solve finally in the near term. "We will get further in understanding [...] poverty if we consider how entrenched the new plutocracy [...] has become than if we look solely for explanations regarding the purported intellectual, economic and cultural inadequacies of the poor." This seems reasonable, considering the roles that societal injustice and random fate have on anyone's fortunes. But in his actual arguments, Abramsky goes all the way. The author has already accepted as axiomatic that the poor have no responsibility for their poverty, either as a cause or as part of the solution. One reason that a solution to poverty evades us is that the "blame the poor" and "blame society" sides keep talking past each other. Abramsky is firmly entrenched in the latter position. The solutions are typical of the view: people need money, so give them money; people need jobs, so give them jobs. It is blaming the victim to suggest that individuals take some part in the solution, even if it's to a problem that they didn't ask for. A few headscratchers make their way into this book. One concerns the role of the housing crisis as a cause of poverty. The book references "upside-down" mortgages as a contributing factor to poverty, and mentions them as an important part of several cases and anecdotes. What is not explained -- what is never explained -- is how the paper value of an occupied house can possibly affect the income or expenses of the householder, in a way that makes him poor. In any case, we are reassured that any problems are due to aggressive marketers, not to the person who signed the note. Another puzzling feature is the frequent mention of malnutrition among the poor. The fact that hunger (as commonly defined) has been largely eliminated would seem to undercut the poignancy of the anecdotes, but it clearly represents a major victory and validation of liberal policies. Instead, the author seems to have swallowed the common myth of rampant hunger (defined as "food insecurity", a technical term with no resemblance to hunger). The author compellingly makes one point for the conservative plutocrat: the liberal democracy which permits accumulation of wealth relies on the participation of all citizens, educated, interested, and enfranchised. The tendency to alienate and marginalize large ever larger segments of the population is not to anyone's advantage. I came by this book in the most charming way. I have a friend who is a social justice activist, and she was having a "house cooling" : the opposite of a house-warming. She was in her 70s and her health had begun to decline, and so she made the decision to sell her home of 40 years and move to an apartment. She invited her friends to come to one final party at her house. All we had to do was bring a box for her packing - and take with us one of her "treasures" that wasn't moving to the apartment I came by this book in the most charming way. I have a friend who is a social justice activist, and she was having a "house cooling" : the opposite of a house-warming. She was in her 70s and her health had begun to decline, and so she made the decision to sell her home of 40 years and move to an apartment. She invited her friends to come to one final party at her house. All we had to do was bring a box for her packing - and take with us one of her "treasures" that wasn't moving to the apartment with her. Being who I am, I chose a book. And, Theresa being who she is, most of her books had to do with diversity, poverty or social justice. This book, and others like it, needs to be read. The economy is changing too fast for our most vulnerable people, and our social safety net has holes in it. Enough already with "starving the beast." It is obscene that taxes for rich people keep going down, down, down, while the minimum wage has failed to keep up with inflation, children go hungry in abysmal schools, and Social Security and Medicare will be unable to meet their obligations to future generations without some action now. But I felt the book was a little disorganized in its presentation, and limited in its prescriptions. Same old thing: the federal government should step in with big programs. #1, I don't see that happening in the current political climate. #2, it might not even be the best solution, or at least the only solution. The author talks about urban farms only in terms of how they illustrate the failure of the federal government to take care of people. I'm not so sure. I think urban farms are a hopeful sign. Look, I'm not against federal programs at all. I hope to take advantage of Social Security and Medicare soon myself. But, I'd rather see people figuring out ways to take care of themselves, at the community level. The first public schools, after all, weren't funded by the federal government. They were funded by local communities. The first hospitals weren't funded by the federal government. They were funded by churches. The US government surely has a role. But I'd have liked to read about more creative, innovative approaches that put people in charge of their own destinies. In the U.S., we have lost the ability to see poverty and the will to understand why it occurs, which perpetuates and deepens poverty for those who suffer it. Numbers differ according to whether one is measuring the entire population or segments of it, such as children. In 2012, UNICEF found the U.S. second only to Romania in child poverty, at 23 percent. In many areas of the country, the rate is far higher. Life expectancy has fallen and infant mortality has risen. The recent recession has exace In the U.S., we have lost the ability to see poverty and the will to understand why it occurs, which perpetuates and deepens poverty for those who suffer it. Numbers differ according to whether one is measuring the entire population or segments of it, such as children. In 2012, UNICEF found the U.S. second only to Romania in child poverty, at 23 percent. In many areas of the country, the rate is far higher. Life expectancy has fallen and infant mortality has risen. The recent recession has exacerbated what was already happening. The book tells heartbreaking stories of people falling deeper into poverty. Many factors contribute to the U.S.’s lack of a social safety net like those in most European countries. It is partly a heritage of the British system in effect when the U.S. was settled (poverty as moral failing, not to be encouraged by providing for those who couldn’t so for themselves). Our federal structure leaves the states to administer welfare programs, leading to marked regional disparities. We have no viable Socialist or Labor parties, as in Europe. Programs that are enacted are subject to being whittled away or repealed with new elections. Tax policy increasingly favors corporations and people who already have means. Unions have been “dramatically weakened.” Part of it is due to our diversity, when people in power lack empathy for those different from themselves. Abramsky, and many others, say that the persistence of poverty is the result of policy choices, not the personal failings or bad luck of those affected. Part 2 outlines many feasible solutions, such as public works to repair infrastructure, eliminating the ceiling on payroll contributions to Social Security, different methods of reforming welfare and Medicaid, eliminating “three strikes” laws. We need more coordination between government agencies to treat poverty holistically, and we should be giving people incentives to work their way up the ladder without losing needed benefits or having to divest themselves of the few assets they may have. “We know what to do” to ameliorate poverty, says Abramsky, but the political will is lacking. We are already paying the long-term costs of our short-sighted policies. Depriving people of adequate nutrition and healthcare cause or contribute to chronic diseases and people flooding hospital emergency rooms. Cut funding for public schools and businesses can’t find qualified workers, while people with no skills depend on vanishing unemployment benefits; some turn to crime. The annual cost of keeping a person incarcerated in some places equals the cost of a year at an Ivy League college. We have money but are allocating it wrong. So much for the summary. As a reading experience, this is a difficult book. Besides the sadness for people living on the edge, it is heavy with facts, figures, and dates that dulled my mind after a while. I also have no head for policy so while I got the gist, I could not quote any specifics about actions to take. And the most discouraging thing is that in the current political climate, nothing will be done despite the occasional demonstrations by the 99 percent. How bad do things have to get and how far behind does the U.S. have to fall before enough people recognize the need for change so that something happens? The basic premise is the scale of poverty in this country is a preventable scandal of our own design and one that endangers us all. The first half of the book does an excellent job of spelling out the consequences of our economic and governmental public policies on continually eroding the economic stability of a large portion of our population. The bottom line question is why do we continually support policies that endanger our present and future economic viability? Likely because the issue is so The basic premise is the scale of poverty in this country is a preventable scandal of our own design and one that endangers us all. The first half of the book does an excellent job of spelling out the consequences of our economic and governmental public policies on continually eroding the economic stability of a large portion of our population. The bottom line question is why do we continually support policies that endanger our present and future economic viability? Likely because the issue is so complex and involves everything from market regulation, taxation, and entitlement programs to policies around incarceration, addiction, education, immigration, foster care, housing, healthcare, wage disparities, job creation, pension reform, and so much more, the second half of the book proposing possible solutions is all over the place. Plus some of the proposed solutions seem both futile and inequitable. There is little likelihood that some of the proposed spending programs will be approved in a political climate where all government assistance programs are under attack. Incentives for better access to affordable healthcare, housing, college education, and jobs in growth sectors need to be available to the population as a whole, not just those in immediate need. Still, many of the proposed solutions highlight the tax revenues we are already wasting, many times because we’re approaching problems punitively rather than constructively, such as our policies around incarceration for non-violent offences and addiction issues. Also raises a lot of good questions around the roles of government vs businesses vs community and other organizations and how best to leverage the strengths of each to ensure more stability for all. An excellent response to those who insanely think poverty is not really a problem in our affluent society, that it could never happen to them, or think poverty is the consequence of individual personal failures and that the poor should be left to sink or swim on their own. A strong argument for realizing that poverty, like physical illness, is the manifestation of the ill-health and bad practices of our overall society. Making economic well-being for all a priority will strengthen our overall body politic. How we deal with poverty is truly a matter of national security. Abransky focuses on the problem that's so ubiquitous that it's invisible: poverty. Whether it's the folks pushing the shopping carts or those living in cars or the kids who wear the same things to school or the folks who are quietly hiding in their houses, waiting for the lenders to come, "clues" about the phenomenal number of people who are living on the margins are everywhere. 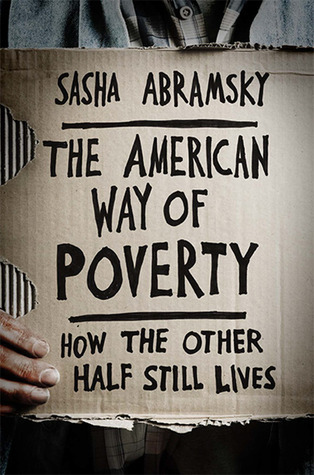 The first part of the book is a portrait of Americans who are impoverished, but Abramsky's point is that this is not a Abransky focuses on the problem that's so ubiquitous that it's invisible: poverty. Whether it's the folks pushing the shopping carts or those living in cars or the kids who wear the same things to school or the folks who are quietly hiding in their houses, waiting for the lenders to come, "clues" about the phenomenal number of people who are living on the margins are everywhere. The first part of the book is a portrait of Americans who are impoverished, but Abramsky's point is that this is not an individual problem, but rather a systemic problem. There are ways in which America's economy and society are structured to create poverty while overwhelmingly rewarding those who happened to miss its pitfalls. The second half of the book looks directly at the current economic/social system to find ways in which the system might be changed so that no one goes hungry, no one is forced to live without shelter, no one is forced to choose between feeding children and heating the house. The subtitle of the book is "how the other half still lives," and, in this age of screaming and ranting and demanding that "big government" disappear, this book brings clear focus onto the fact that we're all Americans and we're all interconnected. "Government" is the way that our group takes care of all of us…and we must act. It's simply immoral for the richest nation in the world to allow people to have to live in such dire straits. Abramsky makes a raft of logical reasonable suggestions, none of which would solve all of the problems, but all of which, if enacted, would allow us all to take pride in our country once again. Is the war on poverty lost? Are the poor responsible for their own poverty or is that debate besides the point? Are there public policy solutions that would address poverty? Abramsky takes a decided liberal view of the issue of poverty. For him, it is a societal disaster and human tragedy. Is is a problem that needs active government policy to address. He makes his case in acknowledgement of the current political gridlock and fierce conservative opposition to anything the government might do to s Is the war on poverty lost? Are the poor responsible for their own poverty or is that debate besides the point? Are there public policy solutions that would address poverty? Abramsky takes a decided liberal view of the issue of poverty. For him, it is a societal disaster and human tragedy. Is is a problem that needs active government policy to address. He makes his case in acknowledgement of the current political gridlock and fierce conservative opposition to anything the government might do to solve the problem. Yes Abramsky presses on with the case. The first half of the book is about the problem itself. It breaks no new ground, but it does capture the scope of the challenge. The second half is the more interesting piece, with a number of proposals that are worthy of consideration - if you think that the government should be doing anything at all. Of course, there are price tags for the solutions and Abramsky has no problem arguing that the wealthy should be paying more. The first two-thirds of this book is excellent. He discusses in detail the most common causes of poverty--job loss, early childbearing, poor education, living in areas of economic depression, mental illness, and drug and alcohol abuse--and interviews in-depth people living in abject poverty from these causes. It is written with both wide-eyed clarity and compassion. To anyone who agrees, the author is stating the obvious. To anyone who disagrees, well, they are unlikely to read this book in the first place. Read it when you want to complain about taxes. Poverty is unjust and we have to be proactive as citizens and voters. A great introduction to a huge problem. Compelling and balanced. Jesus Christ, now I have to review this thing. I read this book out of a need to understand poverty better. It should be required reading for Social Workers and SW students. This book is divided into two sections: firsthand depictions of people in deep poverty situations all across the country, and practical policy suggestions for lifting people out of poverty. I found the first half of the book to be intriguing. Intriguing in that the ways in which people who have nothing have found ways to subsist. Like the couple "camping" on Hawaii's big I read this book out of a need to understand poverty better. It should be required reading for Social Workers and SW students. This book is divided into two sections: firsthand depictions of people in deep poverty situations all across the country, and practical policy suggestions for lifting people out of poverty. I found the first half of the book to be intriguing. Intriguing in that the ways in which people who have nothing have found ways to subsist. 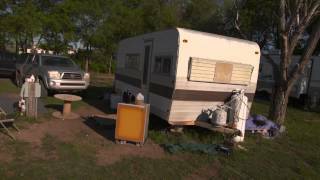 Like the couple "camping" on Hawaii's big island in their home which only has electricity for a couple hours a day....via a generator that they use, when they have gas money. Or the people living in North Las Vegas in tents and boxes within a square mile of the second largest high school in Las Vegas and yet who have never been to see the sights on Las Vegas' famed strip. People living in storage shelters and foreclosed homes and tents and anything you could possibly think to live in (and a few you haven't). The policy part was, dare I say it, hopeful. See, this book was written in 2013, just after President Obama was re-elected, when some of us still had hopes for this country. Before some of us elected a racist, xenophobic reality star who put children in cages and voted himself major tax breaks. The author has a lot of good ideas for policies, and backs up his ideas with the facts and figures. Like a half cent payroll tax to fund an educational opportunity fund for every child when they are born. Like infusing Medicare, Medicaid, and Social Security with millions of dollars. Like reworking TANF so that time limits don't apply during recessions or times of national crises. Like instituting a major overhaul of the minimum wage. The first half of this book was rough to read. It consisted of stories of people and places dealing with extreme poverty. Some of the cases presented were people who'd grown up in poverty, lived in poverty still, and had never had options to rise out of poverty or to raise their kids out of poverty. Other stories were of people who lost everything either through the housing collapse of 2008, or through massive medical bills and the like. There was so much there that didn't really shock me, but c The first half of this book was rough to read. It consisted of stories of people and places dealing with extreme poverty. Some of the cases presented were people who'd grown up in poverty, lived in poverty still, and had never had options to rise out of poverty or to raise their kids out of poverty. Other stories were of people who lost everything either through the housing collapse of 2008, or through massive medical bills and the like. There was so much there that didn't really shock me, but confirmed what I suspected in regards to how increasing numbers of our population "live." The second half of the book was a challenge to meet the realities of poverty head-on, and an exploration of the ways we might do so. Not to pretend it doesn't exist, not to act like the people living in poverty deserve what they've got, not to give them a hand-out, but to extend a hand UP to all who face poverty. To recognize that a child living in poverty, even if it IS through a parent's neglectful behavior, deserves better than that themselves. That people living without the basics of adequate shelter, electricity, food, water, and plumbing are so far behind the national average that it's near impossible to even get TO the national average, much less achieve a so called "American Dream." When one is constantly trying to play catch-up, the thought of actually getting beyond that is actually something impossible to conceive. As the author put it, it's like putting a bunch of people in a foot-race. Some of the competitors are given an unimpeded open lane to run in, others are given a series of hurdles they must jump over. There is really no contest between the two categories of runners. Until we remove the hurdles, the race is rigged. And, we're seeing more and more rigging in our country due to ever-expanding tax cuts upon the uppermost financial tier, and tax increases through city and state sales taxes that increasingly hit the lowest financial tiers ever harder. The author proposes such things as a minute .5% income tax that could be put toward an educational fund accessible to ALL who want to use it for continued education. He proposes means by which we can secure Social Security for the next generations who will need it, as well as Medicaid. And unfortunately, he proposed all this 4 years ago.... We're past even the point now, I'd wager, where some of the mitigation might be possible. We've already got a Republican-led Congress who spend more time OFF work than AT work, and what time they spend AT work is spent in trying to find further financial relief for those at the top, while pulling more relief from those at the bottom. We've seen that very Republican-led Congress twice in the last 4 years actually strike when they thought they might not be able to push through their cuts against those at the bottom of the financial tier. The Author of this book was worried about what our country might look like, how it might survive, if we didn't act immediately upon the need to return our country to a solid financial footing by reinstating taxes that were done away with by George Bush and by George W Bush, if we don't act to restore some equality to our country. 4 years on, I see the extreme unease in our country over these very inequalities, and I hope that we are not past the point where mitigation and relief can be made to work. This was a solidly researched book, and it probably deserved another star than what I'm giving. However, I wasn't a huge fan of the layout of the book. I thought that I would enjoy having the problems and people in the beginning and then having just solutions in the back, however it lost a lot of the emotional aspects, and having all of the solutions crowded together actually made it harder for me to pay attention to individual solutions. But that is not to say that this isn't an excellent book, This was a solidly researched book, and it probably deserved another star than what I'm giving. This was very well written and the personal stories of the poor painted a picture better than all the economic jargon can. My only problem with it is that the solutions are appealing to the liberal side of politics and not at all appealing to the conservative side of politics. I feel like a long term solution will be somewhere in the middle or no one will get on board. I am still searching for a book on how I as an individual can make a difference in the lives of those struggling financially. Reading the first part of this book gave me a clear understanding of the harsh and dehumanizing poverty system in America. The second part added necessary rays of hope. Every American voter and polititian should read this book. It would do America alot of good to discover the real side of poverty no ever sees. I really liked the author's big point: poverty doesn't need to happen. It is also easy to read without alot of academic points, footnotes, etc. Heartbreaking personal histories of poverty in America, followed by a couple of long chapters on what can (realistically) be done. I liked the last couple of sections on policy. It shifted the tone of the book from a kind of anthropological study in hopelessness to how American society might tackle the issue head-on and proactively. This book shows that the problem of poverty isn't EASY to fix, but it can be done. The real tragedy will be if we do nothing in response. "I think poverty to a large extent is also a state of mind," said Carson. "You take somebody who has the right mindset, you can take everything from them and put them on the street and I guarantee you in a little while they'll be right back up there. And you take somebody with the wrong mindset, you can give them everything in the world, they'll work their way right back down to the bottom." What I find most telling about this quote is that growing up his family DID face deep poverty and DID benefit from the use of government welfare. It would be interesting if he took a step back and analyzed how his life may be different if those basic programs had not existed and what could have been possible if better programs were in place. The American Way of Poverty is a two part book. The first part explains many of the ways people find themselves in poverty. Most Americans are one lost job, one medical emergency, or one financial misstep away from poverty themselves. When the housing market crashed in 2009 many people found themselves without jobs, with underwater mortgages, and still needing to pay for necessities. Compound students loans and large medical bills on top of that and finding yourself in poverty is not hard to imagine. Throughout the first section the author tells anecdotal stories that back up the statistics related to poverty. While some of the impoverished land there because of a financial downturn, the author does not shy away from the discussion of cyclical poverty either. All forms of poverty, though, have the stigma of being brought on by poor personal choices and are seen as embarrassing failures by those finding themselves in that position. More often then not poverty is hard to avoid and is brought on by a perfect storm of events. The second section goes through the services that exist and how we should bolster them in order to truly help the impoverished break the cycle of poverty. Many people in our country want to believe that all you need to do is work hard and you can be successful. What is really necessary are programs designed to support the impoverished get back on their feet. Already the current administration has talked about cutting free and reduced lunch programs, head start programs, and other services vital to not only supporting the impoverished now, but also reducing the likelihood that future generations stay in poverty. Throughout the second section ideas on programs to implement, and the statistical evidence that they would work, are given by the author. Abramsky admits that many won't like the suggestions because it would require an allocation of funds that wouldn't win any favors with politicians. Since poor people often don't carry political clout, the oligarchy currently operating in the United States has no need to cater to them. Political clout is carried by agriculture (see farm subsidies), the 1% (see tax breaks for the rich), and big business (see lobbyists). Anytime discussion of poverty comes up, immediately it is said that we are being divisive and creating class warfare. Also brought up are statistics on rising unemployment and how those in poverty should work harder. Many of those on welfare have a job, or two, but minimum wage jobs leave most still at the poverty level. Wal-mart employees require $6.2 billion dollars in aid because their jobs don't pay enough (Source: https://www.forbes.com/sites/clareoco...). So we are telling people to get jobs and when they do, they still don't earn enough to make ends meet. Bring up raising the minimum wage and you are immediately castigated for class warfare. It is a lose-lose proposition. An idea from the book is that instead of looking at unemployment and deciding that we as a country are doing well, we instead look at food security as our baseline for poverty. The current poverty line is set by standards that were established in the 1960s, so many of the formulas are outdated and incongruous with present day financial systems. Overall, I would encourage anyone who thinks that those on government assistance are ghetto queens and lazy, Appalachian hillbillies to read this book. Your eyes may be opened to the fact that class warfare is going on, only it is directed at shaming and punishing America's most needy. A great argument that poverty in the richest nation on earth is a societal failing as opposed to an individual moral failing. Yes, people make horrible decisions - this book doesn't downplay the importance of personal responsibility - but with wages stagnant and the costs of housing, health care, and higher education skyrocketing, it's easier than ever for a sick relative, a broken down car, or even a bounced check to send someone into poverty, much less a global economic recession. He details ho A great argument that poverty in the richest nation on earth is a societal failing as opposed to an individual moral failing. Yes, people make horrible decisions - this book doesn't downplay the importance of personal responsibility - but with wages stagnant and the costs of housing, health care, and higher education skyrocketing, it's easier than ever for a sick relative, a broken down car, or even a bounced check to send someone into poverty, much less a global economic recession. He details how programs created under the New Deal and the Great Society helped reduce poverty, particularly among children and the elderly, but over time, politicians have chipped away at them, chocked their funding, and then complained when these programs didn't produce results. Pensions are disappearing, and budgets for infrastructure, education, and unemployment insurance are being slashed. Abramsky explains how poverty is bound together with so many other issues: failing public schools, crime, foreclosures, declining health, mental health, and incarcerations rates among others. But taken in small steps, there are fixes. For example, he offers some solutions like a tax on stock trades (which apparently America had from the early 1900s to 1964) to fund job training programs, childcare, and public housing; raising minimal wage and tying it to inflation; passing regulations for predatory loans; establishing an earned income tax credit; and supplementing college saving plans. Obviously, few of these observations and arguments are new. Abramsky frequently refers to Michael Harrington's "The Other America," chronicling the lives of the poor in the mid-Sixties when the post-WWII economy was failing to extend to many Americans. Writing from the midst of the Great Recession, Abramsky explains it's not that we don't know how to ameliorate poverty, we just lack the political will to do so. I have to praise Abramsky for the hundreds of interviews with everyday Americans waiting in food lines, living in abandoned tenements, or working three jobs without benefits. It puts a human face on a massive problem. However, he repeats certain points a lot and will sometimes dump several pages of statistics and polls, when they should have been spread out more or relegated to an appendix. That said, it's refreshing to have the latter half of the book devoted to finding solutions to combat poverty, even if some of them are a long shot, especially in today's political environment. I liked how many real-life stories were included in the first half of this book. The second half focuses on his proposed solutions to poverty, which mostly consists of additional taxes, particularly on the wealthy. His position did skew a bit liberal and political, and he made various comments that insinuated Democrats have always been kind and generous to the poor, while Republicans have always been selfish and stingy. This obvious bias left a bad taste in my mouth. While I didn't agree with ever I liked how many real-life stories were included in the first half of this book. The second half focuses on his proposed solutions to poverty, which mostly consists of additional taxes, particularly on the wealthy. While I didn't agree with everything he said, he did give me some things to think about, and some of the solutions proposed would be fairly easy to implement - such as higher taxes for the very wealthy. Though published fairly recently (2013), some of the information is already outdated as far as what aid is available and the restrictions for recipients. "As the stories [of the poor] accumulated.... [what].... struck me with particular force... is the sheer loneliness of poverty, the fact that profound economic hardship pushes people to the psychological and physical margins of society - isolated from friends and relatives; shunted into dilapidated trailer parks, shanties, or ghettoized public housing; and removed from banks and stores, transit systems and cultural institutions. The poor live on society's scraps - a few dollars in government assistance or charity, donated food, thrift-store clothes. They can afford neither transport to venture out of their communities nor simple luxuries such as movies or a cup of coffee with friends in a cafe. They cannot afford to vary the routines of their daily lives. Embarrassed by their poverty, worried about being judged failures in life, and humiliated by that judgment, many told me that they have essentially withdrawn from all but the most necessary, unavoidable social interactions. I don't disagree with his basic premise, but oh, man, are his proposed solutions so pie-in-the-sky as to be embarrassing. It will be a cold day in hell before Congress agrees to cut defense spending or assess higher taxes on themselves and their wealthy donors. People are only as generous as self-interest impels them to be, and no matter how hard or long you explain to people about the universal, long-term benefits of short-term sacrifice, they'll continue to scream about the rank injustice of t I don't disagree with his basic premise, but oh, man, are his proposed solutions so pie-in-the-sky as to be embarrassing. It will be a cold day in hell before Congress agrees to cut defense spending or assess higher taxes on themselves and their wealthy donors. People are only as generous as self-interest impels them to be, and no matter how hard or long you explain to people about the universal, long-term benefits of short-term sacrifice, they'll continue to scream about the rank injustice of the evil taxman wresting their hard-earned money from them in order to reward undeserving layabouts. Why should they care about strangers or children three generations hence when they're working for their own? Nothing will change until the system collapses entirely, and even then many will blame everyone but the guilty because that's the way people work. In that sense, this book is a waste of pages. Sasha Abramsky studied politics, philosophy, and economics at Oxford University. He is now a freelance journalist and senior fellow at Demos who reports on political personalities and cultural trends. His work has appeared in The Atlantic Monthly, The Huffington Post, Rolling Stone, The Nation, The New York Times, The Village Voice, The Guardian, and Mother Jones, among other publications. He live Sasha Abramsky studied politics, philosophy, and economics at Oxford University. He is now a freelance journalist and senior fellow at Demos who reports on political personalities and cultural trends.